Iskra LawrenceThe name of Iskra Lawrence is known, perhaps, to everyone who is interested in fashion. The photos of this British model can be seen in glossy editions. Iskra steadily attracts attention both with her expressive beauty and non-standard parameters. The matter is that the girl is a plus-size model. However, extra kilos and centimeters according to the model measures don't confuse the self-assured blonde at all. 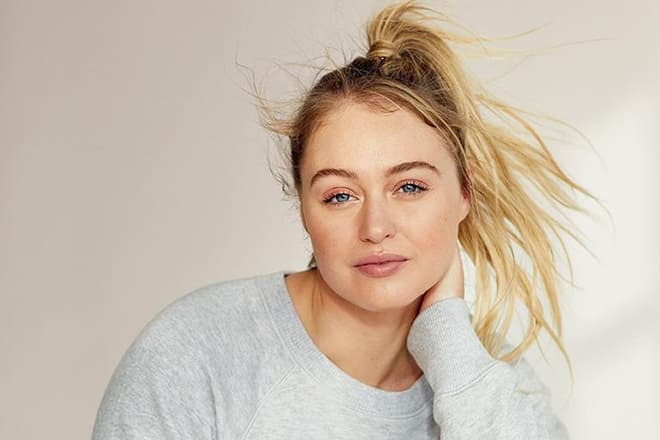 The future supermodel Iskra Arabella Lawrence (this is a full name of the girl) was born in the British city of Wolverhampton on the 11th of September, 1990. At school the girl was among the best pupils, however, Iskra's dreams were far away from the science — Lawrence dreamed of the career of the actress. Right after the school, the purposeful blonde decided to realize her dream and even got a job in the youth theater. However, life had another plan of her, and the biography of the girl soon became connected with the fashion world. Lawrence signed her first contract at the age of 13 years. The editors of "ELLE" magazine noticed the bright gorgeous girl and offered her favorable cooperation. It seemed, that Iskra had already got luck and glory in her pocket, but after a while, the girl was horrified to discover that she began to put up weight. Sometime later the contract with the girl was canceled— the changed figure of the model didn't seem suitable for glossy pages to the representatives of the magazine. By her own confession, at first time Iskra was worrying a lot. The girl couldn't cope with the thoughts of imperfection, tried tens of popular diets and even nearly risked to ruin her health. However, soon she understood that the main thing consisted in "imperfection" — it was her and individuality. This new feeling helped Iskra to cheer up again. The girl distributed photos to the fashion magazines and model agencies, and after a while, Lawrence was invited to take part in the photoshoot for the advertising campaign. She had to advertise the swimsuits, but this juicy fact hadn't frightened Iskra Lawrence. The girl had handled this objective with dignity and soon she became a rightful model of the firm producing underwear and swimsuits for the girls of non-model sizes. After a while, the representatives of the popular shop of lingerie of "American Eagle Outfitters" paid attention at Iskra Lawrence. The new contract has brought to model glory and recognition of which the beauty was dreaming since her childhood. The photos of Iskra in underwear again appeared on glossy turns of the fashionable editions, however this time the girl wasn't embarrassed by her own sizes and forms: she with pleasure accepted herself the way she was. Then Lawrence, having remembered the last experiences and despair because of the excess weight, decided to share her experience with the other girls. The model created her own website "Runway Riot" and began to post her photos, having forever refused the use of retouch and the photoshop. Lawrence considers that in such a way she draws attention to the problems of women who aren't perfect from the point of view of glossy fashion magazines. For the new project, Iskra had chosen the corresponding slogan: "Fashion is for ALL women". At the same time, the model doesn't urge women to give up the sport and to start eating sweet things. The girl emphasizes, that to love your body means to take care of it. Lawrence regularly does exercises, swims and observes that in she has many fresh vegetables and fruits in her daily menu. However, she doesn't resort to diets and starvation anymore. Unlike professional progress, Lawrence prefers to keep her private life in secret from curious eyes of her admirers and journalists. It is known only that the girl isn't married yet. Perhaps, the beauty hasn't met her love yet, and it’s also possible that soon Lawrence will soon please her admirers with the news of the forthcoming wedding. One thing is clear for certain: the model figure (the girl is 173 cm high, and her weight is 80 kilos) has found its admirers. Some time ago Lawrence’s photos were even published in the cult men's magazine "Maxim" in the heading of "Doughnut of Week", has caused a flaw of delighted comments. At present time Iskra Lawrence constantly shares her new photos on "Instagram", motivating the girls to fall in love with their own body and not to seek for some imaginary perfection which simply can’t be reached. The supermodel learned not to pay attention to envious and even spiteful comments of the haters and with pleasure shows her new pictures to the admirers. Also, Lawrence has thought up her own hashtag # HeartNotHate. By this hashtag all the persons willing to distribute kind and encouraging comments to the people who really need it, support each other and are just convinced again and again that no imperfection of appearance should influence the self-assessment. At the beginning of 2018, Lawrence pleased her admirers with another photoshoot. This time the girl took part in the shooting in the company of the Danish model Nina Agdal (the ex-girlfriend of the actor Leonardo DiCaprio). The voluptuous Iskra and the skinny Nina looked originally together, and after the shootings, Lawrence emphasized once again that she didn't feel any slightest complexes concerning her non-standard figure. In the interview, the model admits that she is going to continue to take part in the photoshoots. The girl has shootings in her future plans and, perhaps, even roles in the movies of which the model as dreaming since her childhood. Lawrence plans to prove with her own biography that size doesn't play any role, the main thing is self-confidence and love to your own body.